The memo appears to have been inserted accidentally into an envelope for a rejected letter to Earth Liberation Front prisoner Joyanna Zacher when it was returned to the sender. The letter was rejected for being “unauthorized material”, according to the official form that was also included. 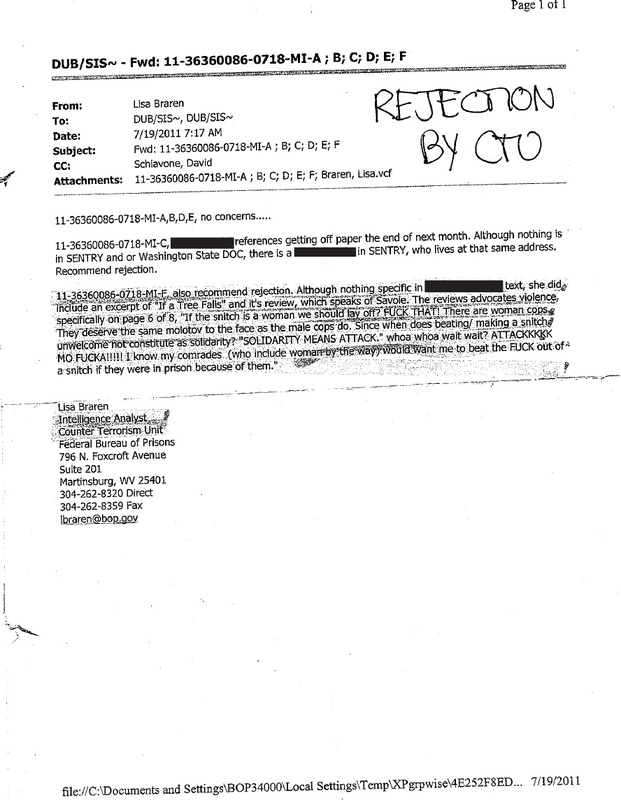 The second document, viewed above, showed specifically who rejected the letter, and why: it contained a review of the film “If a Tree Falls“, a review which the “intelligence analyst” felt advocated violence. The memo “analyzes” two other pieces of mail. One is cleared, and the second is rejected because a database search showed a former federal prisoner lives at the return address on on the envelope. During my incarceration from 2005 to 2007, I cannot recall any instance of my mail being rejected based on content which “advocated violence”, and only one content-based rejection during my entire stay. The trend in federal prisons seems to be towards more restrictions on prisoner’s ability to communicate with the world outside, as this memo indicates. The memo means absolutely nothing new to those who continue to support prisoners by writing them letters, and should in no way dissuade anyone from continuing to write. Incoming mail has always been read in federal prisons. 2) They are rejecting mail for those prisoners based on content – content which is presumably allowable for prisoners not deemed “eco-terrorists”.